The Parrots are one of the latest trippy, hazy rock ‘n’ roll bands to come out of the booming Catalan rock scene of Spain. Along with the critical acclaim of spunky rock groups such as Mourn and Hinds, The Parrots make similarly jaunty, fuzzy garage rock with a psychedelic edge and a feel-good mentality. 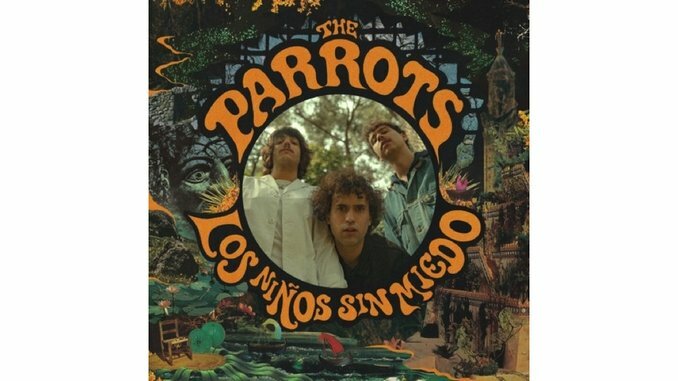 Recorded over a single week last September, The Parrots’ debut album Los Niños Sin Miedo encapsulates the “loose-hipped, primordial rock ‘n’ roll” image that the band has come to define themselves by while adding a care-free summer twinge that is impossible to not want to dance to. The band came up with the idea for Los Niños Sin Miedo—which translates to “The Fearless Kids”—after frontman Diego Garcia, bassist Alex de Lucas and drummer Larry Balboa met at university in Madrid, the epicenter of the Catalan rock scene. Garcia had tried his hand in the industry in the past, acting as the main producer for fellow Catalan band Hinds’ debut album Leave Me Alone. In his true form, however, Garcia eschews all pretenses of professionalism for an album of hazy, sunbaked rock for summer slacking. The opening track “Too high to die” paints a relaxing picture of lighting up on the beach and summer debauchery, as Garcia screams over bouncy guitars and maracas. Along with the punky summer edge of The Parrots is a distinctive youthful eminence recalling Spanish yé-yé style pop, making the simplicity of the band all the more charming. “Let’s do it again” is equally carefree, but unrelenting in the band’s quest for more good times. With all members of The Parrots hailing from Spain, the band’s minimal grasp of the English language adds to the charm and carefree nature of Los Niños Sin Miedo. The language barrier does not scare The Parrots off, as Garcia embraces his elementary knowledge of the language. “When I first heard Jonathan Richman singing in Spanish, I loved it. He gets it all wrong, and that has so much charm,” Garcia stated in their press material. However defiant the band comes off with their screaming and distortion, it is never meant with ill intentions. The Parrots supply their best tunes when they are having a good time, exactly why they act best to soundtrack the fun times under the sweltering summer sun. For The Parrots, all of the fun they have is just in a day’s work.